When it comes to a newly planted garden, a little attention now can pay off big later! The first few weeks after planting is a critical time for vegetable plants. It is when tender seedlings and transplants are at their most vulnerable stage. Up to this point, most vegetable plants have spent the majority of their life inside. They were watered regularly, and kept sheltered from wild temperature swings and the burning hot sun. And now, they have been planted outside to deal with the harsh realities of Mother Nature. Talk about tough love! But with a few simple things in mind, you can get your newly planted garden off to a great start. And that of course, means a great harvest later! Here’s a look at 4 of our biggest and best tips to get your garden growing into a lush, vegetable producing machine. Whether you have a traditional garden, raised rows, or raised beds, keeping foot traffic away from your plant’s root zones is critical to their long-term success. In the first few weeks of a newly planted garden, vegetable plants are desperately trying to establish a healthy root system underground. Mulching around each plant with compost is a great way to feed them too! Those roots are crucial in soaking up much-needed water and nutrients all summer long. They also hold the plants strong against wind, rain, and the heavy load of veggies in mid-summer. If the area 12″ around each plant is left undisturbed, it allows roots to more easily grow and expand. Compacted soil from heavy foot traffic in this zone can leave roots shallow and small. Be careful as you walk through the garden to stay in the walkways, and off of the root zones. It’s one reason raised rows, raised beds and container gardens are so effective. By nature, they are designed to keep the root zones out of harms way. More than anything else, be sure to apply a healthy dose of mulch around the base of each plant! Mulching helps retain valuable moisture in the soil. That keeps young plants from drying out too quickly, and you from having to water too much. 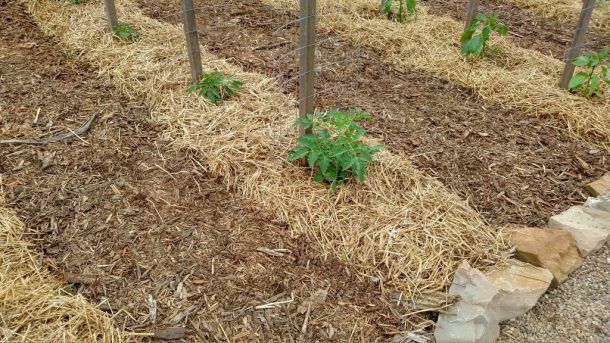 Mulch also aids in keeping the soil temperature regulated from the burning hot sun and cooler nights. Consistent soil temperature goes a long way in keeping plants growing strong. Last but certainly not least, mulching plants helps keep weeds out. Those weeds steal valuable nutrients from the soil needed by young plants. So keeping them out is more than just keeping the garden looking pretty. What are the best garden mulches? Grass clippings, finished compost, straw and shredded leaves all work wonders. When and how much to water a newly planted garden can be a tough chore to size up. Too little water and plants shrivel up. Too much water can keep them from developing a deep root structure needed to grow strong. A good rule of thumb is that plants need about an inch, to an inch and a half of water per week. That equates to about 1/4 of a gallon of water to each plant’s root zone 3 times a week. If it’s not falling from the sky, then you need to supplement.It is best not to water every day unless you are having extremely hot weather. If you water every day, the plants will never send roots deeper. That results in less hardy and underdeveloped roots and plants. The best time to fertilize a vegetable garden is when it first starts growing. A little boost of all-natural nutrients when plants are young can help them power up for the season. We like to apply a little compost or worm casting tea to each plant about every 14 days, for the first 45 days after planing. After that, it’s best to stop fertilizing. Fertilizing too late in the season, or applying too much will keep plants growing leaf and root structure, and not vegetables.